Folly-on-Weir is a village in the Cotswolds just recovering from a murder in its midst. Now they’re thrown back into the turmoil of violent death again. Instead, she is found dead in the bottom of the manor’s well. It’s a particularly vicious death and there’s no way it can be considered an accident. Since Alex Duggins, owner of the Black Dog Pub and her childhood friend and would-be lover and veterinarian Tony Harrison discovered the body, there’s an immediate hue-and-cry with accompanying speculation. Tony’s still under suspicion for the disappearance of his wife while he lived in Australia. When the officers from that other incident are assigned to the case, people wonder if Alex and Tony know more than they’re telling. Harry Stone is rumored to be her lover. Handsome but unstable, he’s to receive everything else if her other heirs die. “‘Harry’s the first beneficiary . . . he gets a bundle . . . if Jay dies without issue, the house goes to Harry, too.’” All Pamela’s beneficiaries are also potential suspects in her murder. In spite of Tony’s insistent protection and Detective Inspector O’Reilly arguments, Alex puts herself in harm’s way to discover the murderer—but there appear to be too many suspects. What no one knows is that Pamela had caught the eye of someone else from Folly, someone who kept that passion a secret until it exploded into murder, and now, that person won’t hesitate to kill again . . . and again . . . The outcome to the investigation will be a shock. Folly is a place where everyone knows everyone’s business . . . except when that business is murder. 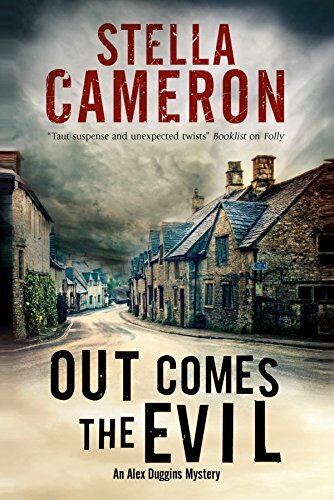 In Out comes the Evil, the passions exposed after the crime prove no one really knows his neighbor after all.